Car Problems? 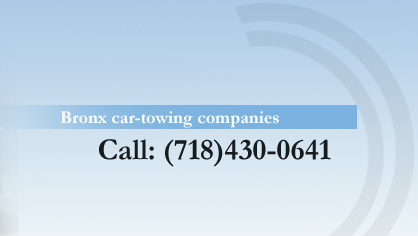 Our 24 hr Bronx Towing Hotline is standing by to take your call. You've come to the right place. 24 Hr Bronx Towing & Emergency Repair is proud to provide you with the roadside assistance you need, whether you lock your keys in your car, run out of gas, have a flat tire or even need a jumpstart, our fast and reliable service is always available when you need it, guaranteed. Our staff is on call 24 hours a day, 7 days a week. Our skilled craftsmen at Bronx Towing apply their experience, knowledge and judgment to expertly restore your vehicle's condition. Copyright 2009 All right reserved.